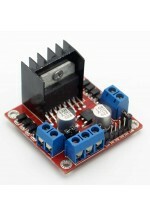 Dual motor driver board for controlling up to two DC motors off a microcontroller. 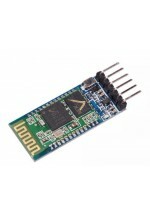 ..
Bluetooth to TTL serial module for microcontrollers. Uses Serial Port Protocol (SPP). Can be run as either master or slave. 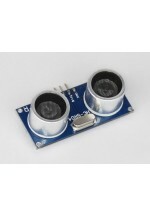 ..
Ultrasonic sensor for detecting distance. Hypothetical range of 2cm-400cm with 0.3cm precision. .. This 2x16 LCD is for use with microcontrollers such as the Arduino Mega2560 or Uno. 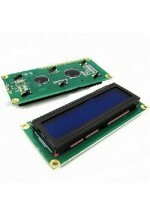 This LCD can be used in 4 bit mode, 8 bit mode, or with I2C backpack. ..
LCD Keypad Shield for use with Arduino microcontrollers. Includes 5 readable buttons and one reset button, 2x16 character LCD display. The program shows information from the controller to a user by the LCD display. The LCD allows us to quickly show information while not connected to the PC. www.rabbitrobots.com\download\BittyRobot_LCD.zip www.rabbitrobots.com\download\LCD.zip www.rabbitrobots.com\download\LCD_UltraSonic.zip www.rabbitrobots.com\download\LCDKeypadTest.zip www.rabbitrobots.com\download\LCDKeypadTestTutorial.zip .. Simple cherry switch. Output can be switched between two pins by pressing the large switch on top. 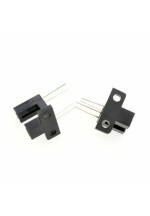 ..
IR Opto-Interrupter with 6mm gap. 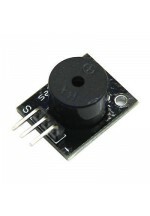 Requires ~20kΩ pull-up resistance to microcontroller and ~1kΩ load on IR LED ..
Standard passive piezo buzzer module for use with micorcontroller boards. Piezo Sound Buzzer: Activated by the Arduino controller to a user by sounds. This robot kit can sound off with simple beeps, horn squawk, or music notes of a song. www.rabbitrobots.com\download\Tone.zip .. 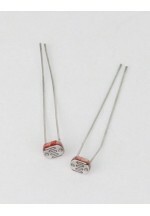 Simple photo resistor. Has variable resistance based on light levels Photo Cell - www.rabbitrobots.com\download\PhotoCell_Uno.zip ..
Sensor shield for microcontrollers. Comes with 5 analog I/O ports, 13 Digital I/O ports, interfaces for parallel and serial LCD devices, Bluetooth module interface, ultrasonic sensor interface, RS232 port, I2C port, and an SD card interface. 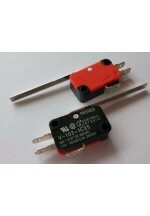 ..
Standard S3003 Servo with 360° of constant rotation. Comes with extra servo horns (arms) and screws. 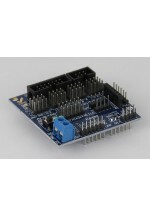 ..
Driver board to control stepper motors with a microcontroller. Contains built-in LEDs to show the current phase. 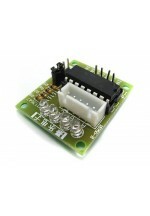 For use with five-wire stepper motors. Caution: Should not draw power directly from microcontroller board, the motor attached to the driver can overdraw current and potentially cause damage. ..